With the weather warming up your business should be too! This is the time where people hit the streets to soak up some sun and an A-frame is a perfect tool that your business should have to really make you stand out. A-frames are extremely portable and cost-effective. Although they come in different shapes and sizes, they typically are lightweight and can fold right up when you want to store them. They are also budget-friendly, your one-time investment can bring you more foot traffic and increase sales for an extended period of time. BUT just because they’re affordable does not mean cheap quality! There are different materials you can choose from whether they are durable plastic, wood, metal, whatever works for you. If you want a less permanent choice then you could always go with a chalkboard A-frame so you can change your message anytime and then we can customize it with your logo to give it a personal touch. 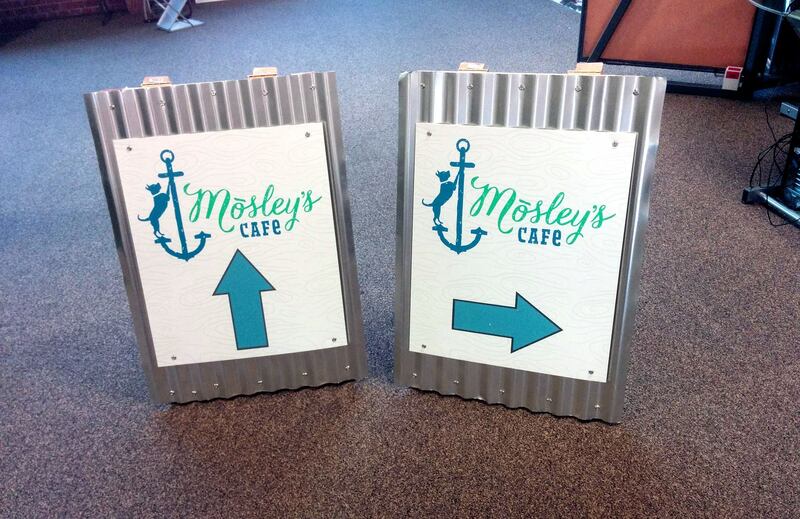 Directional signs are also a great way to go with A-frames like the picture above. Mosley’s Cafe is a hidden gem in Alameda right on the water but unfortunately, it’s exactly that–hidden. But directional signs allow people to now enjoy this little, yet great, Cafe. If you are a sidewalk business or out of sight, A-frames are something to consider. A small investment in an A-frame can go a long way during the outdoor season!